The last two weeks have been a real mixture of extreme heat and then showers and light relief and then back to the heat again. This makes planning activities a bit more difficult as some days have been only fit for resting and sheltering from the sunshine. Add to this the arrival of some regular visitors. 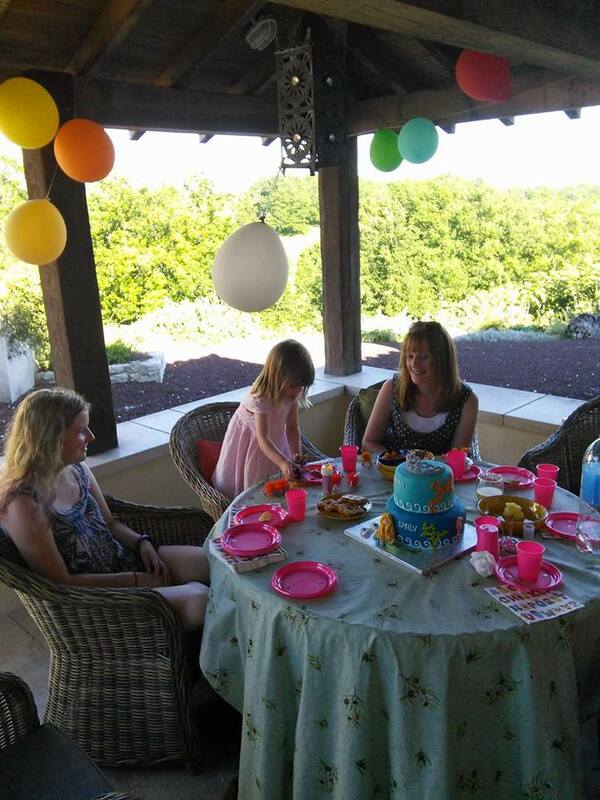 Firstly family from England, including our (very nearly 3 year old) granddaughter, Emma, who had a ‘month-early’ birthday party with us. 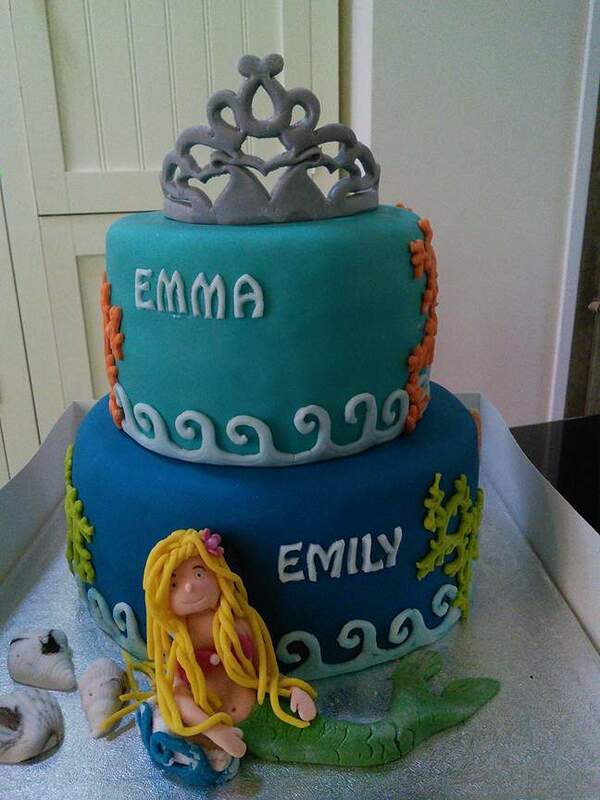 This involved a lot of balloons and a rather special mermaid cake which she shared with Emily who’s also visiting and who has just turned 18. Then (we think for at least the 10th year) Joe and Edwine arrived from Brussels for their holidays – they are really family now and part of the fabric of this place. Suggesting places for people to go and eat is always difficult. We have our favourites but then we are set in our ways and when you add other people to the group it forces us to think more carefully about other ages and preferences. At this time of year we get emails from many of our season’s guests who are trying to work out where to book(as there are often 18 of them – they are wise to be doing this in advance) and when you do not know the people concerned there has to be a bit of a leap of faith. This week, as an extended family, we didn’t go far to eat out; but we did have some lovely meals. On Sunday we went to the market at Montcuq (46800) which is always a favourite with visiting family and guests. Sometimes we eat at the Café de France in the centre of the village but as we’d one or two less than adventurous eaters we went on to the next village - St Daunes. Here you’ll find what’s possibly the area’s best pizza restaurant. Restaurant L’Ecole as its name suggests was formerly the village school and is very easy to find and has plenty of parking. There are other options other than pizza – including the ever popular ‘moules et frites’ but if you haven’t tried their pizzas yet then you should have a go – a favourite with our family is any pizza with duck on it. 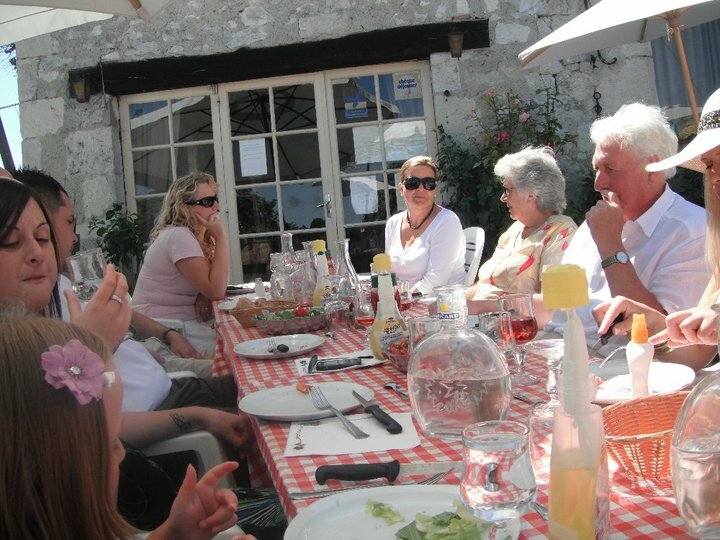 Then one very warm sunny lunchtime we had a trip up to what has been a firm family favourite since at least one of our now ‘all grown-up’ family first went there and sat in high-chair. The Auberge de Lauzinie, close to Lacour de Visa (82190) has never changed. When it’s cold or dark we eat inside and when it’s warm and dry we enjoy the simple terrace with its almost ‘Tuscan’ view of the surrounding countryside. All the meats are cooked on an open fire and for us the duck steak ‘magret’ is a must-have. Needless to say we all ate far too much and just about managed to get back home for a nap – or in the case of those under three years old – yet another swim. As always with these times, eventually Bergerac Airport comes-a-calling and it’s time for people to make their way back home. It’s always sad to say goodbye, but Las Razes will be here for them all when next they need there next break and a week of duck-based dining.